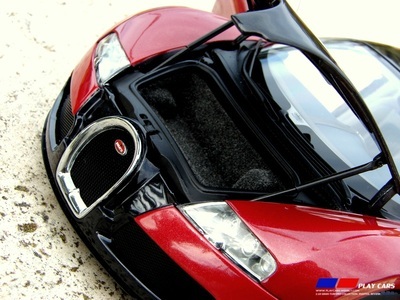 The 1:18 AUTOart Bugatti Veyron is one of the best way to own the most defining car of the first decade of the 21st century. As the Bugatti Veyron is so popular, there are lots and lots of models of it. The overall best though remains the AUTOart offering at least the production version. At the exterior is no other way of saying, it is stunning. The dimensions are pretty much spot on, when compared to the real car. The panel gaps and overall finish is also excellent. Real metal mesh is used for all grills even ones you’ll barely notice in the smaller nooks and crannies. There is also a smaller mesh around the central exhaust pipe. The wheels are in typical AUTOart style and are beautifully made, accompanied by dark gray brake discs intended to mimic the carbon fiber reinforced silicon carbide brake discs on the real car. Behind the discs are two hoses and a fully working independent suspension made of metal. The model features opening front lid, doors and a fully functioning spoiler which is a thing of beauty. 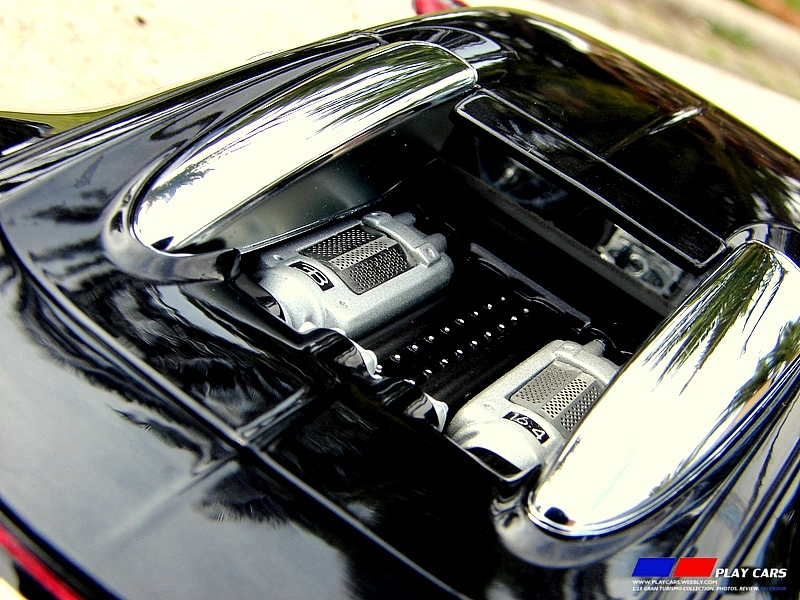 The model also features a removable engine cover to show the astonishing engine bay. The maker has done a good job and it is a pleasure to look at the various components of the engine. This is made easier, thanks to the magnifying glass that is included in the box. On the under side of the car there is a small button that releases the spoiler. It itself is mounted on two springs so it is a nice idea to keep a finger on it so not to fly away someday. It may happen as there are a lot of tiny and fragile details on the model as a whole, so be careful with it. Underneath the front trunk lid there’s not much to look at. Just an empty but carpeted load area and a couple of gas struts used to keep the lid opened. Moving on to the interior. It is fully carpeted, true to the original and generally well made. But it also contains a few disappointments. The first one is the rather cheaper look of the center console. The one on the concept model, made again by AUTOart is much more pleasing and intricate. The bigger issue though is the omitting of a very key feature.In the real Veyron, on the floor to the left of the driving seat, there are a few slots operated with the key of the car, where you can lock the spoiler, override it and so on. These slots are missing in the model. What is even stranger is that they were present, along with the hand brake, in the concept model. Maybe not that big of a miss for some, but is a prominent feature of the real car and it should not be missed by a top company like AUTOart. Underneath the model doesn’t show much. Well anything in fact. But that is the way with the real Veyron as well. 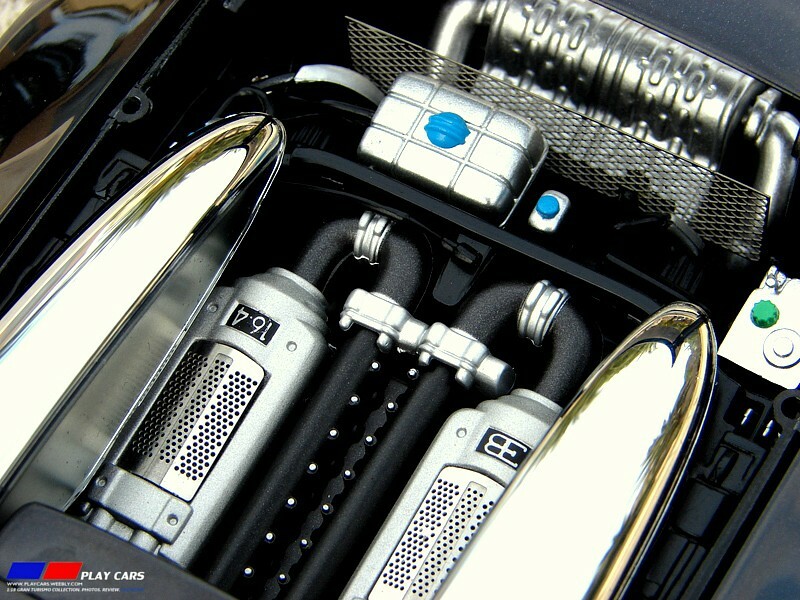 Overall the AutoArt Bugatti Veyron is one of the best models out there. There are a couple of mistakes and issues with fragility but when there are nearly 200 individual parts on a model, a few relatively small mistakes here and there are normal.